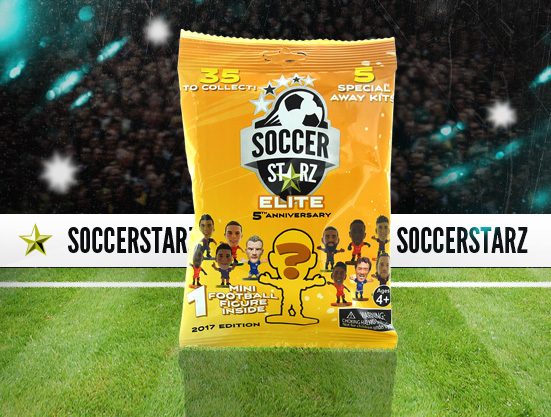 The SoccerStarz Elite 2017 Edition Foil Bag includes 40 of the worlds top players from your favourite teams including Barcelona, Real Madrid, Man Utd and Chelsea and is set for release in early September 2016! All 40 players can either be found on an orange, yellow, gold or silver base. Look out for the 5 special away kit SoccerStarz – Willian, Cristiano Ronaldo, Gareth Bale, Lionel Messi and Harry Kane. These are exclusive to the Elite 2017 Edition Foil Bag! Harry Kane is even wearing gold boots to mark winning the Golden Boot award last season! Watch our Foil Bag unveiling video and click on the players name to check out their profile!